For the past century, the owners of the fruit companies called our country “Banana Republic” and characterized our politicians as “cheaper than a mule” (as in the infamous Rolston letter). 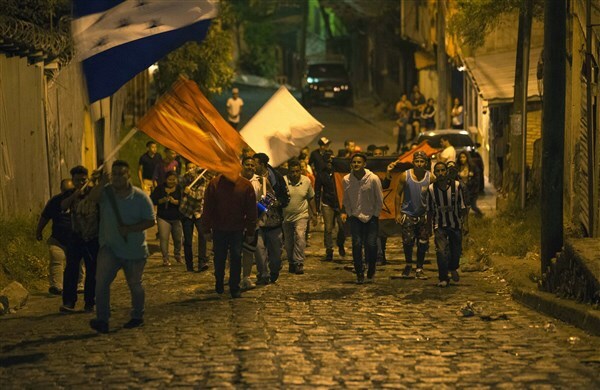 Honduras, a dignified nation, has had the misfortune of having a ruling class lacking in ethical principles that kowtows to U.S. transnational corporations, condemning our country to backwardness and extreme poverty. We have been subject to horrible dictatorships that have enjoyed U.S. support, under the premise that an outlaw is good for us if he serves transnational interests well. We have reached the point that today we are treated as less than a colony to which the U.S. government does not even deign to appoint an ambassador. Your government has installed a dictatorship in the person of Mr. Hernández, who acts as a provincial governor–spineless and obedient toward transnational companies, but a tyrant who uses terror tactics to oppress his own people. Certain sectors of Honduran private industry have also suffered greatly from punitive taxes and persecution. You, the people of the United States, have been sold the idea that your government defends democracy, transparency, freedom and human rights in Honduras. But the State Department and Heide Fulton, the U.S. Chargé d’Affaires who is serving as de facto Ambassador to Honduras, are supporting blatant electoral fraud favoring Mr. Hernández, who has repeatedly violated the Honduran Constitution and (as noted by the United Nations Office of the High Commissioner for Human Rights) basic human rights. He is responsible for the scandalous looting of USD $350 million from the Honduran Social Security Institute and while he lies to you shamelessly that he is fighting drug cartels, he has destroyed the rule of law by stacking the Supreme Court with justices loyal to him. The people of the United States have the right to know that in Honduras your taxes are used to finance, train and run institutions that oppress the people, such as the armed forces and the police, both of which are well known to run death squads (like those that grew out of Plan Colombia) and which are also deeply integrated with drug cartels. People of the United States: the immoral support of your government has been so two-faced that for eight consecutive years the U.S. Millenium Challenge Corporation has determined that the Hernandez regime does not qualify for aid because of the government’s corruption, failing in all measures of transparency. With this record, the Honduran people ask: Why is the U.S. Government willing to recognize as president a man who the Honduran people voted against, and who they wish to see leave office immediately? People of the United States: We ask you to spread the word, to stand up to your government’s lies about supporting democracy, freedom, human rights and justice, and to demand that your elected representatives immediately end U.S. support for the scandalous electoral fraud against the people of Honduras, who have taken to the streets to demand recognition of the victory of the Alliance Against the Dictatorship and of President-Elect Salvador Alejandro César Nasralla Salúm. We can tolerate difference and conflict, seeking peaceful solutions as a sovereign people, but your government’s intervention in favor of the dictatorship only exacerbates our differences. The electoral fraud supported by the U.S. State Department in favor of the dictatorship has forced our people to protest massively throughout the country, despite savage government repression that has taken the lives of more than 34 young people since the election, and in which hundreds of protestors have been criminalized and imprisoned. We stand in solidarity with the North American people; we share much more with you than the fact that the one percent has bought off the political leaders of both our nations. As descendants of the Independence hero Morazán, we want to live in peace, with justice and in democracy. The Honduran people want to have good relations with the United States, but with respect and reciprocity.